The high temperature solid oxide fuel cell (SOFC) is identified as one of the leading fuel cell technology contenders to capture the energy market in years to come. However, in order to operate as an efficient energy generating system, the SOFC requires an appropriate control system which in turn requires a detailed modelling of process dynamics. 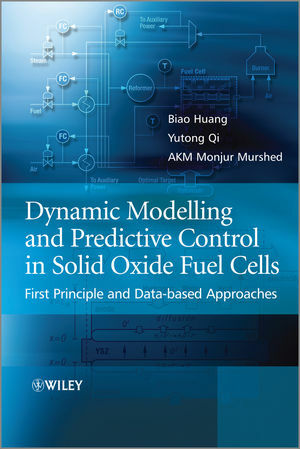 Introducting state-of-the-art dynamic modelling, estimation, and control of SOFC systems, this book presents original modelling methods and brand new results as developed by the authors. With comprehensive coverage and bringing together many aspects of SOFC technology, it considers dynamic modelling through first-principles and data-based approaches, and considers all aspects of control, including modelling, system identification, state estimation, conventional and advanced control. The tutorial approach makes it perfect for learning the fundamentals of chemical engineering, system identification, state estimation and process control. It is suitable for graduate students in chemical, mechanical, power, and electrical engineering, especially those in process control, process systems engineering, control systems, or fuel cells. It will also aid researchers who need a reminder of the basics as well as an overview of current techniques in the dynamic modelling and control of SOFC.